1) Basic Passages of Scripture. a) 1 Corinthians 11:5 5 But every woman that prayeth or prophesieth with her head uncovered dishonoureth her head: for that is even all one as if she were shaven. b) 1 Corinthians 14:34-35 34 Let your women keep silence in the churches: for it is not permitted unto them to speak; but they are commanded to be under obedience, as also saith the law. 35 And if they will learn any thing, let them ask their husbands at home: for it is a shame for women to speak in the church. c) 1 Timothy 2:11-15 11 Let the woman learn in silence with all subjection. 12 But I suffer not a woman to teach, nor to usurp authority over the man, but to be in silence. 13 For Adam was first formed, then Eve. 14 And Adam was not deceived, but the woman being deceived was in the transgression. 15 Notwithstanding she shall be saved in childbearing, if they continue in faith and charity and holiness with sobriety. 2) Definition of the terms used by Paul. b) 1 Cor. 14:35 – learn: denotes (a) to learn . . ., to increase one’s knowledge, frequently to learn by enquiry, or observation, e.g., … 1 Cor. 14:35. . . . W. E. Vine husband – denotes in general, a man, an adult male (in contrast to anthropos which generically denotes a human being, male or female); it is used of man in various relations, the context deciding the meaning; it signifies a husband [texts omitted]. See Man. W. E. Vine. [Neither Thayer nor Vine lists 1 Cor. 14:35 as illustrative of this word. The Theological Dictionary of the New Testament does include the passage as illustrative of “husband” as opposed to man. Keep in mind, however, that the context determines the meaning.] shame, to arouse your shame, 1 Cor. 6:5; 15:34. (Ps. 34:26 (Ps. 35:26); Ps. 68:8,20 (Ps. 69:8,20); respect, reverence, Sophocles, Polybius, Josephus, others.) Thayer. c) 1 Tim. 2:11 – silence (from the adjective h`su,cioj, which see; the feminine expresses the general notion (Winer's Grammar, 95 (90)), cf. aivti,a, avreth,, e;cqra, etc.) (from Homer down); 1. quietness: descriptive of the life of one who stays at home doing his own work, and does not officiously meddle with the affairs of others, 2 Thess. 3:12. 2. silence: Acts 22:2; 1 Tim. 2:11f. Thayer. d) 1 Tim. 2:12 – to teach; the Septuagint for to teach; 1. absolutely, a. to hold discourse with others in order to instruct them, deliver didactic discourses: Matt. 4:23; 21:23; Mark 1:21; 6:6; 14:49; Luke 4:15; 5:17; 6:6; John 6:59; 7:14; 18:20, and often in the Gospels; 1 Tim. 2:12. b. to be a teacher (see dida,skaloj, 6): Rom. 12:7. c. to discharge the office of teacher, conduct oneself as a teacher: 1 Cor. 4:17. Thayer. to usurp authority (a Biblical and ecclesiastical word); hence, a. according to earlier usage, one who with his own hand kills either others or himself. b. in later Greek writings one who does a thing himself the author"; one who acts on his own authority, autocratic, equivalent to auvtokra,twr an absolute master; cf. Lobeck ad Phryn., p. 120 (also as above; cf. Winer's Grammar, sec. 2, 1 c.)); to govern one, exercise dominion over one: tinj, 1 Tim. 2:12. Thayer. silence – see above. 3) Basic principles learned from these passages. a) Women prayed and prophesied in the early church in some context. 1 Cor. 11:5.
b) Women were to keep silent in the churches. 1 Cor. 14:34.
c) Women are not permitted to speak [in the churches]. 1 Cor. 14:34.
d) Women are commanded to be under obedience, as also saith the law. 1 Cor. 14:34.
e) If they will learn anything let them ask their husbands at home. 1 Cor. 14:34.
f) It is a shame for women to speak in the church. 1 Cor. 14:34.
g) Women are to learn in silence and subjection. 1 Tim. 2:11.
h) Women are not to usurp authority over the man. 1 Tim. 2 :11.
i) Women are to be in silence. 1 Tim. 2:11.
j) These injunctions are based on Eve’s conduct in the Garden of Eden. 1 Cor. 14:34; 1 Tim. 2:13-14. 4) Questions that may be answered by the application of these passages and principles. Answer: The short answer is “Yes.” Scripture addresses the relationship between men and women in the church and in the home. It does not address that relationship in the secular world, e.g., the world of business or education or politics. We do know that Lydia was a seller of purple. Acts 16:14. Her husband is not mentioned. The worthy woman of Proverbs 31 bought real estate and planted vineyards. She was married, but the role, if any, of her husband in these activities is not revealed. While there are many opinions about the roles that women ought to play in the secular realm, there are no limitations placed upon women’s role in the secular world in Scripture. There is one caveat – the woman who is active in the secular realm cannot, with God’s approval, neglect the role that He has given her in the home. This is not to say that the Bible teaches that a woman’s place is only in the home. It does not. The truth is that the same thing is true of the man – his activity outside the home does not relieve him of the God-given duties that he has in the home. b) Question: Simply does God allow women to head/lead the church? I am quite comfortable with women ministers and as heads of churches. Am I correct in my feelings? Answer: The scriptures teach that a woman is not permitted to preach or lead in the church. 1 Timothy 2:11-12. The word “teach” in this passage is from the Greek didaskoo, defined by Thayer as “to deliver didactic discourses.” One cannot preach without delivering a “didactic discourse”; women are forbidden to deliver a “didactic discourse”; therefore, women are forbidden to preach. Further, this passage forbids the exercise of any authority whatsoever by women over men in matters of a religious nature. Evangelists are to “rebuke with all authority.” Titus 2:15. Therefore, a woman cannot preach or evangelize. 1 Timothy 3 and Titus 1 require a bishop or elder to be the “husband of one wife”; thus a woman cannot be a bishop or elder. Many today argue that Paul’s prohibition was based on culture and that, since culture has now changed, women preachers are permissible. Such arguments are specious. Paul’s argument was based on the conduct of Adam and Eve (1 Timothy 2:13-15), not culture. No change in culture can change God’s Word. But did Joel not prophesy (Joel 2:28-32, quoted by Peter, Acts 2:16-21) that “I will pour out of my Spirit upon all flesh: and your sons and your daughters shall prophesy”? Certainly he did, but remember that Peter said of that which transpired on Pentecost that “this,” i.e., Pentecost, was that which was spoken by the Prophet Joel. Acts 2:16. God had promised that he would pour out his Spirit on all flesh, and it was this “pouring out” that had just been witnessed. Acts 2:33. At least two things are worthy of note. 1. Peter did not say that the daughters would prophesy in the worship service. That they prophesied in some setting is established by 1 Cor. 11:5. Moreover, we know that Phillip had four daughters who prophesied. Acts 21:9. To the extent that “prophesy” can be expanded to include teaching, we know that Priscilla joined Aquila in teaching Apollos the word of the Lord more perfectly. 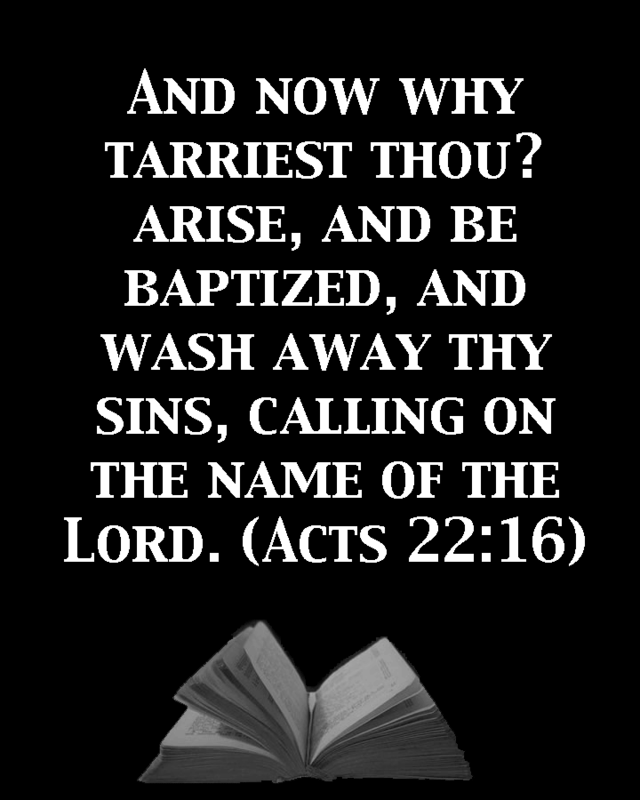 Acts 18:24-28. Somehow I imagine that Timothy never stopped learning from his mother and grandmother as long as they lived. 2 Tim. 1:5. I know that I didn’t. Lenski more than likely described well what was prophesied and what happened: “The chief effect of the Spirit’s activity is always prophesying, not in the narrow sense of foretelling future events, but in the broad and far more important sense of voicing the saving and blessed will of God to men everywhere.” The gospel is now for all flesh from servants to handmaidens. Acts 2:18. They may all teach the gospel. c) Question: I would like to know where in the Bible do you find that it is OK to use the computer and the internet. I would also like to know if women are not to be given authority in the church why did Paul speak of Lydia as the leader of a church and why did Jesus hold women in high regard? Answer: Your real question seems to be the second question. I am assuming that the first question is meant to apply to the use of the computer and the internet in the church, though it does not say so. The two questions. Taken together, imply that (1) since the computer and the internet are used in the church, and (2) since Jesus held women in high regard, and (3) since Paul spoke of Lydia as the leader of a church, that it is inconsistent not to permit women to have positions of authority in the church. You need to recognize that difference between specific and generic commands. When God gives a specific command man must not deviate from it. For example, when God told Noah to build the ark using a specific type of wood, all other types were eliminated. God did not have to list every other type of wood and tell Noah not to use each one of them. Christ’s telling his disciples to go into all of the world and preach the gospel is an example of a generic command. He did not tell them how to go or how to preach. Man may go on his feet, on a mule, in a car, or in an airplane. Using any of these means he has still done nothing but go. Having gone, he may preach in person, by letter, by radio and television, or by the internet. Using any of those methods he has still done nothing but preach. As for Lydia, the record in Acts 16 does not reveal that Paul ever called her the leader of a church. There is not even a hint of a suggestion that Lydia was the leader of the women who on the Sabbath had gathered by the river to pray. In fact, she seemed to be from Thyatira, not Philippi where Paul was preaching. She was the first convert to Paul’s preaching. She did own or rent a house in Philippi which she used in plying her trade. Finally, if others of the women were converted and a congregation was established with only female members, Lydia could, in the absence of Paul, assume a leadership role without usurping authority over the male. (1 Tim. 2:12.) As long as Paul was present he would undoubtedly be the leader of the congregation until elders were appointed. (Titus 1:5.) You are, of course, correct that Jesus held women in high regard. However, that fact does not change at all any of the commands of scripture related to the role of women in the church. The husband is to be the head of the wife (Eph. 5:23). At the same time the husband is to hold the wife in such high regard that he loves her as Christ loved the church and gave himself for it (Eph. 5:25). There is no inconsistency. It is difficult in today’s world to maintain the teaching of Scripture in regard to woman’s role in the church, especially since much of the denominational world has turned from it and gives women roles in violation of the teachings of Scripture. God has given men specific roles; He has given women specific roles. When those roles are changed there is an inconsistency between the practice of man and the will of God. For a further discussion of this subject see the lessons on 1 and 2 Timothy on this web site. The implications of the alternate translations can be quite different. In The New International Version, it is evident that all women should stay away from leadership roles within the church, yet the second translation indicates that wives, in the context of their relationship to their families, should keep silent. This appears to imply a more domestic meaning. Perhaps wives should not argue personal or family matters in front of the church, but should keep silent out of respect for the church and their family. With this in mind, could it be possible that there is room for women to actively participate in leadership roles in the church? Also, could this indicate a possible fallacy with the way we look at scripture, the way it is translated, and the authority given to it? Thank you for taking the time to hear and answer my question. Answer: You are correct that the same Greek word is used for “woman” and “wife” with the meaning being determined by the context. The same is true of the Greek word for “man” and “husband.” Every translation that I checked that has been published as a generally accepted (though some are questioned) translation translates 1 Cor. 15:34 as “women.” I am not familiar with The Message translation. However, the portion of 1 Cor. 15:34 that you cite from it demonstrates that it is at best a paraphrase and at worst a poor commentary. The Greek speaks of silence, not disruption. Further, the Greek says nothing about “when they should be listening.” While such translations sometimes provide interesting thoughts, they should never be relied on for serious Bible study. Further, the assumption that The Message implies a more domestic context is without support from the context. It clearly refers to the assembly. Even The Message admits that the context is worship. If the translation “women” is correct, it is not limited to married women. Moreover, given the context, there is no reason to limit the word to wives. Why would Paul place restrictions upon married women preventing their preaching and teaching, but leave the single women free to do so. Additionally, there were certainly unmarried women in the congregation. See chapter 7. Some conclude that wives must be in view because the word for man or husband (plural) in v. 35 is translated “husbands.” Based on the context “men” would be the better translation. This is so because clearly Paul is not speaking of husbands and wives in this context, but of the two sexes as such. Thus, in both places the general translation is dictated. Finally, female leadership in the church must also pass the test of 1 Tim. 2:12. The woman is not suffered to teach or to usurp authority over the man. To the contrary she is to be in silence. Confusion sometimes arises because people fail to note the difference between the setting in 1 Cor. 14 and 1 Tim. 2. 1 Cor. 14 relates to the assembly; 1 Tim. 2 relates to a wider context. It is compounded because it is not noted that two different Greek words are used for “silence” or “silent.” The word in 1 Cor. 14 means to be silent. We might say “hold your peace,” and some suggest that it should be so translated in 1 Cor. 14. The word in 1 Tim. 2 means to be quiet or peaceful or submissive. It is used in 1 Pet. 3:4 where it is associated with “meek.” In the broader context outside of the assembly it is quiet, peaceful submission that is commanded, not silence or refraining from speaking. 1 Tim. 2 only restricts the woman from teaching and thereby usurping authority over the man. Some suggest that these passages have no application in today’s world because we have outlived them and our culture is different. Note, however, that the restrictions are not based on culture, but on creation and Eve’s role in the original transgression. These reasons are neither local nor historical and must not be so treated. There is nothing in these passages that indicates a possible fallacy in the way we view Scripture and the authority given to it. The Message does suggest that we must be careful in the way that we translate it. Many of the modern speech translations go far afield from the Greek text, most generally in a manner that supports unscriptural theology and thus supports arguments to support unscriptural positions. It is unfair to broadly condemn The Message translation given the lack of information; it is not unfair based on what is quoted from it here to advise reading it with suspicion and care. e) Question: I have read several different answers and also have looked into this subject myself and still have some questions regarding [the role of] women in church. 1: If a woman is to keep silent in the church does it also mean not to testify as we do in our church? 2: What if you are married to a man that is "slow" of learning? Then what? 3: Our preacher believes that it is okay for a woman to preach and my husband and I both believe that it is wrong? If so, how do you try to explain it to them? f) Question: I'm a little confused and maybe just misunderstood. You said that when it came to singing that used musical instruments outside the church building, it was against scripture, that assembling is worship which is all the time. But when you talk about women being silent you differentiate assembly for Sunday morning worship and Bible class. Maybe the Greek words are different and if they are please let me know. If the assembly is worshipping, then women should be silent even in Bible study. Answer: The problem is that two different settings are being confused. First, the worship assembly is always worship. There may be other reasons for assembly, such as an incorporated congregation having a business meeting where under the law the members are the “shareholders.” An assembly of the entire congregation might also be called for imparting information. But the worship assembly is always worship. It is this assembly in which women are forbidden to take leading roles. They are not restricted from participating in the worship assembly. For instance, the women sing. The women participate silently in prayer, as do all men other than the one leading prayer. Women participate in giving of their means. Women worship silently in the reading and study of God’s word, as do all men other than the one leading. Women participate in commemorating the death, burial, and resurrection of Christ in the Lord’s Supper, but do so silently as do all men with the exception of those men presiding and serving. However, not all worship is done in the church assembly. There is private worship such as family or personal devotionals. Songs sung to God in worship, whether in the assembly or in private, must be acapella according to the teaching of scripture. The Bible class does not generally involve worship in song, but if it does, it would undoubtedly be as worship and must be acapella. The Bible class itself, however, is generally not considered to be a worship assembly of the church; rather it is an opportunity for Bible study and learning, much like a school classroom. That process often involves the asking and answering of questions. Any participant is free to ask a question or to enter into a discussion. That is the purpose for which the class has been convened. That said, as other answers on this website indicate, if believing men are present in the class, women are forbidden to teach. Questions 22, 40, 41, 44, 49, and 65 all discuss various aspects of this issue. g) Question: I know women should not preach on the pulpit. But what about women teaching teenagers? Most of our teens are baptized and their ages range from 15 to 20 yrs. They include both young men and women. Can you give me biblical back up? Thanks. Answer: Three primary passages control public discourse by women – 1 Corinthians 11:5; 14:34-35; 1 Tim. 2:11-12. The totality of these passages establishes that a woman is forbidden to preach or teach in the assembly. For a fuller discussion of 1 Cor. 11 and 14, see the class notes on that passage on this web site. 1 Tim. 2:11-12 proclaims that a woman is not to teach or to usurp authority over a man. “Teach” in this passage is from didasco, which means to give a didactic discourse. These passages clearly do not apply to all settings. For example, Priscilla, with her husband Aquilla, privately taught Apollos, a preacher, the way of the Lord more perfectly. 1 Tim. 2 prohibits two things – didactic discourse and usurping authority over a man. The word translated “usurp authority” means to exercise dominion over another. Some argue that a woman can even give a didactic discourse if a man or men give her permission. Not so. Man cannot give a woman the right to do something that God has prohibited. A teenage Bible class is not private, but neither is it the assembly of the church. In this day when children of Christian parents are obeying the gospel at young ages, the young boys are just that – young boys. They are certainly not men within the meaning of the above passages. However, it is my judgment that, even though the older teenage boys are not “men” (contrary to their own opinion), it would be better for their class to be taught by a man. In fact, this would be a good time to follow Titus 2:3-5. Divide the older boys and girls. Let men teach the boys and women teach the girls. There are many lessons that are suited for each that are not suited to the other. Finally, the upper age limit of your question is 20. By college and by the age of 20 boys have become young men. Male teachers should certainly be used. h) Question: Can a woman baptize? Answer: Baptizing a person is not teaching. If it violates any scriptural injunction it would be that the female is not to exercise a leading role in the worship. Even if it were otherwise all right, it is best to keep in mind that some things that are lawful are not expedient. 1 Cor. 6:12; 10:23. Obviously if there is no man present a woman not only can but should. Personally, I have never seen a situation where such was necessary, but I can envision its happening. While living in Lubbock, my wife taught a class for women at the jail. Many of the students were baptized. Had I or others not been available she absolutely should have performed the baptism.